When I began this blog so long ago, I envisioned a place where the various aspects of the paranormal could be intelligently discussed. I wanted to see people share ideas, solutions, questions and information in a way that would lead us to some sort of resolution. Oh, I knew that we wouldn’t solve everything and that sometimes we’d just have to agree to disagree, but I hadn’t expected the nastiness that has developed at times. I didn’t expect the name calling or the superior attitudes displayed by those at both ends of the spectrum. So, as of now, that will end. I will not tolerate nasty attitudes, name calling, or the silliness that is sometimes displayed. No one’s theories are stupid and if you can’t make the point without using that word or others like it, then I will delete the comment, no matter how elegant the rest of it might be. Call someone a name, or suggest they have little or no intelligence, I will delete the post. I’m also done with some of the lesser paranormal arenas. I don’t want to hear that there is something of value in the Alien Autopsy when those who made the aliens have admitted it, when the “tent” footage was created as a “joke” or when most of the autopsy is faked but there is some “real” footage in it. The Alien Autopsy is a hoax and we don’t need to revisit it. The same can be said for the Roswell Slides. They show the image of an unfortunate child who died hundreds of years ago and all the discussion about it should be over. The documentation exists telling us all we need to know and we should have ended the discussion the moment the placard was “deblurred.” Each of the conditions suggested by the proponents have been met and when they were, the conditions were then changed. The Allende Letters were admitted to be a hoax. 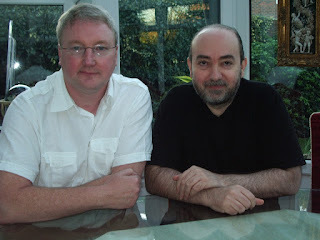 Carlos Allende (or Carl Allen) admitted to Jim Lorenzen decades ago that he had invented the whole thing because Morris Jessup’s writings scared him. But even the admission of the main character in the hoax is not good enough and we continue to hear about the Philadelphia Experiment which is all part of the same hoax. I exposed this, based on interviews with some of those involved decades ago, but we still hear about that nonsense today. And let’s not get into arguments over religion. They are inappropriate here, cause way too much friction and will offend way too many people. The purpose here has never been to talk about religion. Here’s the deal. Let’s discuss the cases cordially. Let’s take a look at the various points of view and realize that we’re not always right whoever we might be. There are areas for discussion by those who hold competing views. But slide off into the silly, into the nonsense and the nasty; I will delete the post without hesitation. Insult me or others and the post is gone. I am, of course, the final arbitrator of the rules and if you don’t like them, there are many other blogs that might appreciate your contribution. Once again I’m dragged back into the nonsense that is the Roswell Slides. It should be clear to everyone who is able to think at all that the slides show the image of an unfortunate child who died hundreds of years ago. No one has ever offered an explanation of how we got from the image of what is clearly a mummy to the idea that it was the body of an alien creature. How did they make that first incredibly dumb leap of logic? So, one of those who had once suggested the body was alien, though based solely on an examination of the slide, had now reversed himself. After seeing the available documentation, he changed his mind. He told me that looking at a photograph is fraught with pitfalls, and mentioned the fact that the quality of the Slides photograph was not very good, the details were not clear due to the blurry photograph, which was taken at an angle from the body (and possibly distorted by the glass in the case). If Adam Dew and his pal, Joe Beason, had any thoughts of proving how credulous UFO investigators are for some kind of a documentary, they failed at that. This wouldn’t have worked had they provided high quality scans of all of the slides to researchers. Given that, those researchers would have been able to read the placard in a matter of hours. How do I know? Because within hours of a high resolution scan appearing on Dew’s website, the placard was read. I’ll throw one other thing out here. I believe that the mystery caller who told Nick Redfern about all this, the man who allegedly overheard a conversation in Midland, Texas, was probably either Beason, Dew or a pal of theirs. The idea that someone in Midland overheard this conversation, heard enough to understand so much of what was going on including the nondisclosure agreements, and then knew Nick Redfern, is just too much of a coincidence. It had to be arranged so that the story would get out and the hype could begin. And the hype did begin right there. This should have never happened. 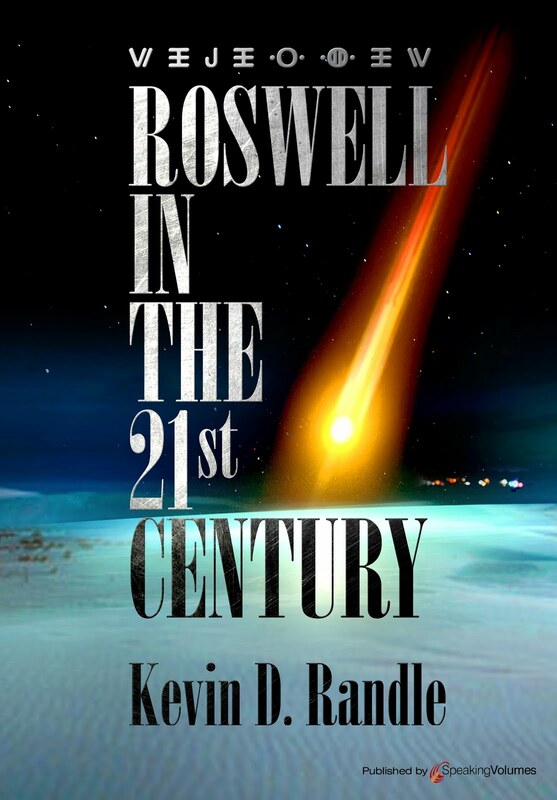 It was a combination of the secrecy imposed by Dew and Beason and the enthusiasm of the Roswell investigators for the final “smoking gun” evidence. Had anyone looked at all the red flags and asked some very basic questions, this would have been seen for what it was. The majority of the blame probably belongs to Dew and Beason, but there is plenty to be shared by the others who participated in the long investigation and the program in Mexico City. We should all learn from this and change the way we do business. Since it seems that some in the skeptical side of the UFO question are outraged at the lack of credible research at the other end of the spectrum, I thought it time to turn the tables. Yes, we all know that the Roswell Slides was a fiasco from the beginning but some of the things under discussion now seem to be a little less definitive. 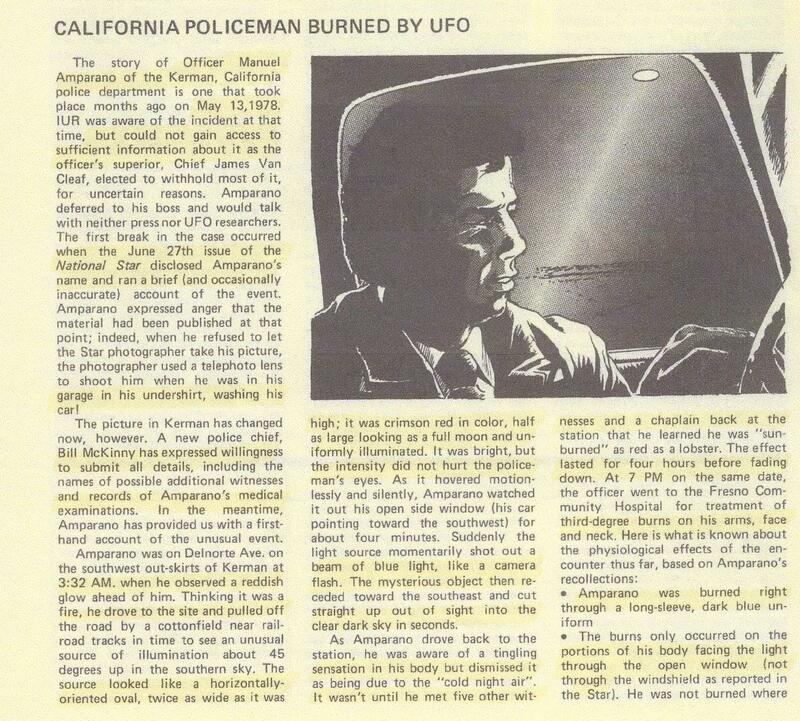 I mean, first claiming that we had UFOlogically increased the burns on the California police officer from first degree to second and third degree, and then wondering where the idea of second degree came from because the sheriff’s report only mentioned the third degree burns. Although Lance Moody suggested the idea of the third degree burns came from the sheriff that doesn’t really matter because the documentation for it existed and it was not an attempt by us to elevate the severity of the burns. It was reporting something that could be documented. Combat assault in a UH-1H helicopter. some of the assumptions that Philip Klass made in his analysis. 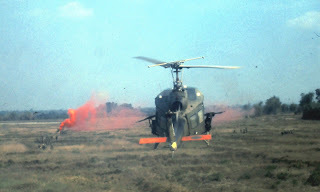 I base this on my training and experience as a helicopter pilot in the same type of aircraft flown by Coyne that night. 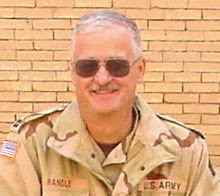 Coyne was, in 1973, an Army Reserve captain and the aircraft commander of the UH-1H helicopter flying northeast from Columbus, Ohio to Cleveland (though in the stateside environment he would be considered the pilot). With him were co-pilot First Lieutenant Arrigo Jezzi, Sergeant John Healey, seated in the left rear and Specialist Five (Spec 5, E-5) Robert Yanacsek, seated in the right rear. Initially it was Sergeant John Healey who spotted an object or a red light off the left side of the aircraft (or the western side) at about 2300 hours [11:00 p.m.] and heading to the south. He thought it was brighter than the red navigation lights on an aircraft and he could see none of the other aircraft lights required by the FAA. This light disappeared behind the helicopter and Healy thought nothing more about it. A few moments later at 2302 hours, Specialist Five (Spec 5, E-5) Robert Yanacsek, seated in the right rear, saw a red light on the eastern horizon. He, at first, thought it was a red warning light on a radio tower, but the light wasn’t blinking and it seemed to be pacing the aircraft. He watched for a minute or two. Finally the light seemed to turn so that it was coming toward the helicopter and when it did, he mentioned it to the pilot, Coyne. Coyne glanced out the right window (eastern side) and saw the light. He suggested that Yanacsek keep an eye on it, though there didn’t seem to be any real danger from it. After about half a minute, Yanacsek thought that the light was coming at them and Coyne agreed. Coyne then took the controls of the aircraft from the co-pilot and believing the object might be on a collision course, pushed down the collective (or technically, the collective pitch, that is a lever on the left side of the seat of the pilot or co-pilot) which changes the pitch of the rotor blades so that the aircraft will gain or lose altitude. He entered a 500 foot per minute descent, which is not very rapid. They had been flying at 2500 feet which over that part of Ohio is about 1200 feet Above Ground Level (AGL). Healey now left his seat and moved forward, crouching between the seats occupied by the Coyne and Jezzi. The light was getting brighter, or as Healey would later say, brighter than the landing lights of a commercial jet. The red light was closing on them quickly and dangerously. Coyne again pushed down on the collective to increase his rate of descent, eventually pushing it all the way to the stop. Believing that he was not descending fast enough, he pushed the cyclic (think of the yoke on an airplane here) forward so that he would be descending even faster. At this point Coyne looked up and said the light, which he could now see was an object, was covering the front of the windshield. Coyne said that there was a red light at the front of the object, a green light that seemed to reflect off the rear of the object, and a green light, like a searchlight coming from the rear. The overall shape seemed to be that of a cigar or cylinder and under the tail was a pyramid-shaped structure from which a green beam came. The overall object was not glowing, but Coyne, and his crew, could see the general shape against the bright, starry background. The object may have hovered over us for 10 to 12 seconds. It seemed like a long time. It seemed like it was there for so damn long. It was just stopped, for maybe 10 to 12 seconds, and I mean stopped. It wasn’t cruising, it was stopped. It didn’t waver, it didn’t put on the brakes, it didn’t gyrate – it was just like in a cartoon. It was coming at us, and then, in the next frame, it was there, just like that. No noise, no flaps. It reminded me very much of a submarine. I really didn’t think we would collide, because the object was obviously completely in control of the situation. The object hovered there for those long seconds and then took off toward the northwest. They could see the light at the rear of the object was bright white. Coyne glanced at the altimeter and realized they were at 3500 feet. Coyne said the collective was still full down and he couldn’t explain the ascent. With what he was doing, the helicopter should have been descending rapidly. Coyne then pulled up on the collective (which, of course, the opposite of what he should have done to stop an ascent but then the collective was full down so he couldn’t have pushed it any lower) and at 3800 feet, they felt a bump and the climb ceased. With the climb stopped, and Coyne now in control again, began a descent back to the cruising altitude. Klass explained his long search for a meteoric explanation but found nothing to corroborate his idea. He did bring up the Zond IV reentry in 1968 where a number of people believed they saw a cigar-shaped craft with lighted windows as the rocket broke up. He seems to have confused Yanacsek’s sighting on the right side of the aircraft, with Healey’s sighting of the red light that was seen out the left that slid to the rear, heading south. If it was the same object, then that approach from the other side moments later clearly proves that it wasn’t a meteor. He also reported that he had asked others in a position to have seen the fireball or bolide if they had, but there were no reports of anyone else seeing it. Given the time of day, meaning not all that late, and the area over which it would have flown, it seems reasonable to believe that someone else would have seen it. In today’s world, a fireball would be widely reported, often with video of the event. In that time, it would have made the news, though the reports probably would have been confined to the immediate area. Klass mentioned that the cockpit was bathed in green light as the object passed overhead and reported that there are two Plexiglas panels set above the pilots’ heads and these are tinted green. They were called, cleverly by the flight crews, the greenhouses, but they are directly over the pilots and are not part of the windshield. Klass seemed to have confused these green tinted areas for something on the windshield (or canopy as he called it) much as cars used to have a green tint at the top of the windshield. The crew was not looking through the greenhouses and the light was not coming directly through them. Besides, the crew described other colored lights on the object which they were watching through the clear, Plexiglas windshield. Could leaning back in the seat, trying to see the UFO above have caused Coyne to pull up on the collective (as opposed to have pulled back as Klass suggested)? Not really given the way the controls are configured. Could he have pulled back on the cyclic in such a circumstance? Maybe, but there would have been other consequences to that action, including a slowing of the airspeed, a change in the engine noise and a change in the orientation of the view in the cockpit which would have suggested that something had happened. Or, in other words, that would have been noticed because that is how the Army pilots were trained. With absolutely no evidence of a bright meteor that night, Klass has created one out of thin air and the skeptics have not asked him to explain that position. They don’t ask him why Yanacsek’s account is not mentioned, or the confusion about which crewmember saw what and where. Finally no one asks him how it would be for the pilot to have lowered the collective to arrest the ascent when it was already at the bottom stop and couldn’t be pushed down any further. He just speculates, contrary to the pilot testimony, that one or the other had pulled up on the collective earlier (which he could have then pushed down, but said that he couldn’t, so he pulled up). It is clear that Klass does not understand the Army procedures, and that he reports his speculations as if they were facts. 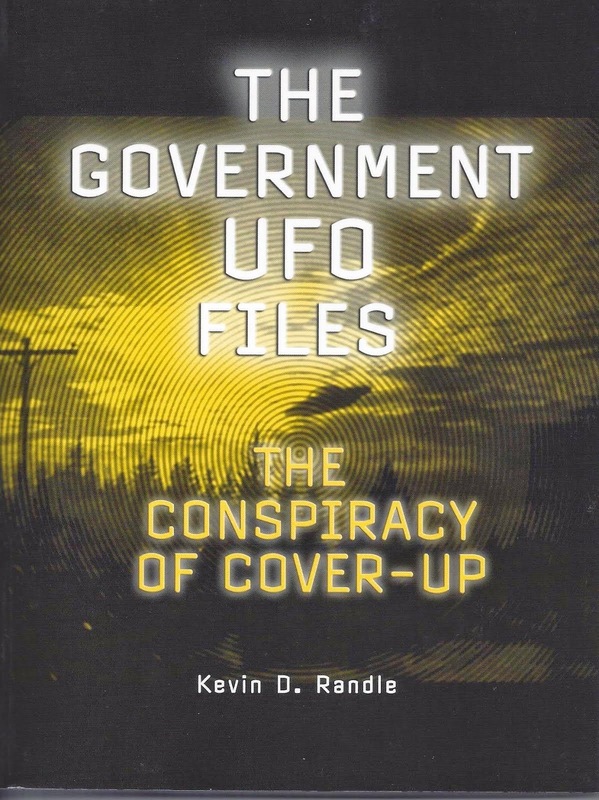 None of this means that Coyne and his crew saw an alien craft, only that Klass’ analysis of it is flawed by what others would call “Ufological thinking” if Klass was at the other end of the spectrum. So, now let the defense of Klass begin, regardless of the facts. For those who wish another source, the NICAP.org website has a short article that references the IUR article from September 1978 on pages 10 – 11, which appears above, and articles from the Fresno Bee for May 19, 1978 and February 23, 1979. 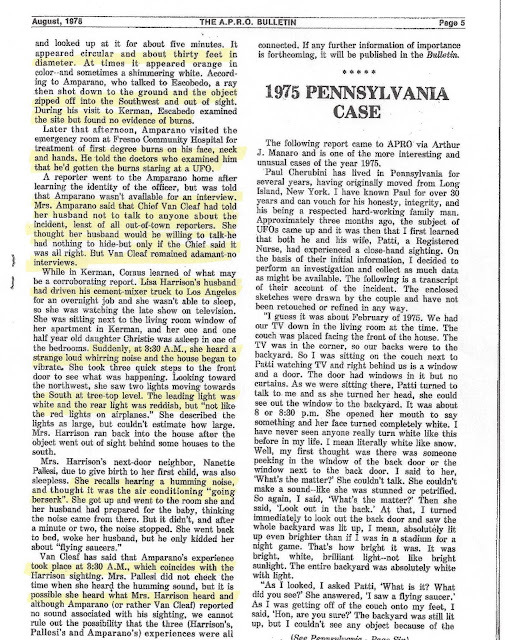 Dr. Swords did write an article for the IUR, Volume 34, Number 4 (September 2011) which does mention the Kerman, California case, but only in a table on Foundational “burn-like” skin cases. It gives the date and nothing more. The coincidence here is that both articles were published in September in the IUR, though decades apart. There is no byline on the first IUR article. The only names associated with the IUR then were J. Allen Hynek and Allan Hendry. It would seem that Hendry was the author, though, as I say, there is no byline. This is, however, a secondary issue. The question seems to be, where did the report of second degree burns come from? Clearly the man was burned as the documentation and the witness testimony establishes. Since there is documentation for third degree burns from both the sheriff and the medical facility, I’m not sure why we have bogged down in the question of the second degree burns. At any rate, if this was one of the articles on chasing footnotes, I would have mentioned that the article attributed to Michael Swords was not written by him but it does appear in the IUR. I will note that I try to attribute the information to the proper source and give credit where credit is due. Here, I believed that Swords, because of the reference I had found, was responsible for the earlier article. So, we clear that up, and I apologize to Swords for dragging his name into this. We can move on to the other questions. Oh, just for fun, I will note that most of us know that attempting to determine distance, size and speed of an unknown object seen in the night sky with no points of reference is nearly impossible… if the witness gets it right, I would suggest that it more luck than observational ability and that angular size, angle above the ground and direction would be more important than guesses about precise figures for size, distance and speed. 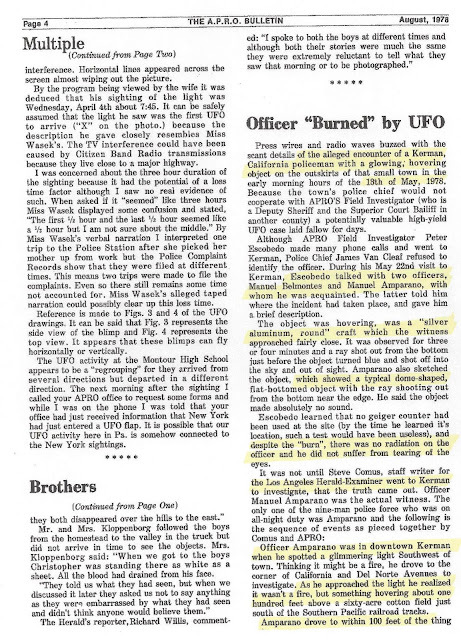 Dr. Michael Swords has suggested in an article in the IUR, "Can UFOs Cause physiological Effects, Part 2 (September 2011) that there are cases that demonstrate there are side effects to UFO sightings that can be investigate (which I mention here only because it was in that article I found the reference to Kerman). While there is not a bit of metal to take into the laboratory in this case, there are the physical reactions of the witness, police officer Manuel Amparano, who was a veteran of five years on the force. Had the situation developed differently, there was research that could have been conducted, but wasn’t. 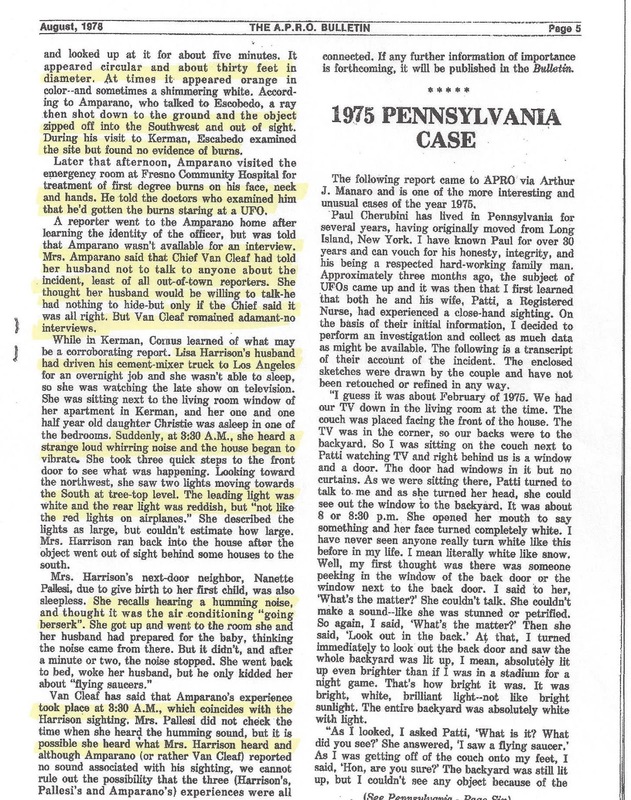 According to the information available, including that in the APRO Bulletin of August 1978, Amparano was on late night-early morning patrol when he spotted, what he thought was a fire in the distance. He thought it might be youngsters setting palm trees on fire, but as he neared an intersection, saw that it was something else. Amparano later said that the oval-shaped object was twice as wide as it was high and that it was a bright crimson, about half as large as the full moon. He said that it was about one hundred to one hundred fifty feet off the ground and that it was twenty-five to fifty feet in diameter. He was close enough to it and it was large enough that there was no question that it wasn’t some sort of conventional craft. As it hovered overhead, it glowed with an intensity that did not hurt his eyes. He watched it out of the side window of the car for about four minutes until a bright blue beam shot out of the craft that Amparano described like that of a flash from a camera. The UFO then climbed out silently toward the southeast, and finally disappeared straight up in seconds. Although he felt a slight tingling, he thought it was the results of the cold night. He drove back to the station. There he met several fellow officers and the police chaplain, who mentioned that he looked as if he had been sunburned. According to Swords, the sunburn lasted for about four hours before fading. The IUR article noted that at 7:00 p.m. that night, Amparano went to the hospital for treatment of second and third degree burns to his face, neck and arms. The trip to the hospital was documented in various hospital records and because of the injury, he applied for, or his boss, the chief of police applied for, worker’s compensation. That too was documented. … Lisa Harrison’s husband had driven his cement-mixer truck to Los Angeles for an overnight job and she wasn’t able to sleep, so she was watching the late show on television. She was sitting next to the living room window of her apartment in Kerman… Suddenly, at 3:30 A.M., she heard a strange loud whirring noise and the house began to vibrate. She took three quick steps to the front door to see what was happening. Looking toward the northwest, she saw two lights moving towards the South at tree-top level. The leading light was white and the rear light was reddish, but “not like the red lights on airplanes.” She described the lights as large, but couldn’t estimate how large. Mrs. Harrison ran back into the house after the object went out of sight behind some houses to the south. There were still other, somewhat ambiguous reports. According to something referred to as the “a Seattle-based phenomenon research center,” an astronomer in Fresno reported a “reddish ball” close to the ground. 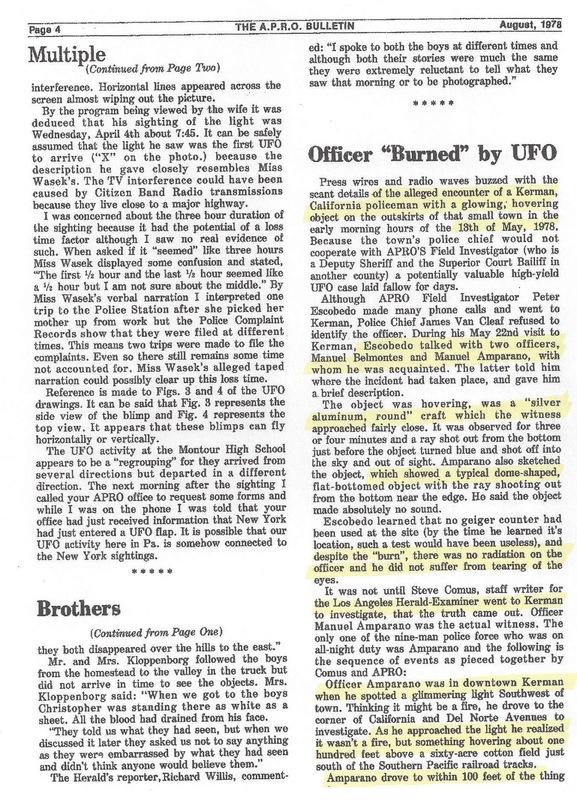 At about the same time someone called the Fire Department to report a fire that was in a direct line from where Amparano saw the UFO. The Fire Department said that they found no evidence of a fire. At the station, Amparano called the Air Guard, the Fresno Airport and the weather bureau, wondering if they had anything on their radar scopes, or if there had been any other reports. While he was making the telephone calls, police officers A. J. Byington and Bob Muller, saw the burn marks on his face. They then discovered that Amparano had been burned through his shirt as well. At that point, they all returned to the cotton field, but there was nothing there to be seen. What is important here is that these injuries, regardless of source, were documented by the hospital authorities, and there was that worker’s compensation claim that was also filed which further corroborated the injuries. A reporter went to the Amparano home after learning the identity of the officer, but was told that Amparano wasn’t available for an interview. Mrs. Amparano said that Chief Van Cleaf had told her husband not to talk to anyone about the incident, least of all out-of-town reporters. She thought that her husband would be willing to talk – he had nothing to hide – but only if the Chief said it was all right. But Van Cleaf was adamant – no interviews. While interesting, it’s not clear if the sighting was at the same time and exactly what Soderberg saw, other than it was similar. This could be further corroboration of the sighting, but at this point no one has followed up on it. The UFO… was behind the trees lining the west side of Del Norte Avenue and near the ground hovering midway below the tree tops which gave the impression the tree was on fire… The UFO was first sighted at Trinity and Shaw Avenues by a Fresno County resident who called the North Central Fire Department Kerman Station and reported a grass fire in a field…The fire men arrived on the scene and found no evidence of a fire… A short time later Thomas Addis was working in a vineyard… when he observed a fire ball moving at tree top level… Also five Kerman Police Personnel observed my physical appearance when I reported for duty and confirmed that I was not sunburned prior to going on patrol. Officers A. J. Byington, Bob Muller, Bill McKinney, Jon Crouch and Chaplin Tom Johnson were with me inside a well light police station. Fresno Community Doctors, Allen Mau and T. T. Shigyo reported that officer had a sun burnt condition when examined at community hospital. Dr. Shigyo said that microwaves can burn the flesh through clothing without damaging the cloth. Chief Van Cleaf requested workman compensation for on the job injury. This case becomes important because it has multiple chains of evidence. There was the physical effect which was the burns suffered by Amparano and documented by the hospital records, and observed by his fellow police officers. There were additional witnesses to the red object in the sky at about the time that Amparano made his sighting which creates another chain of testimony. Had the chief of police reacted with a more open response, some of that additional testimony might have been documented as well. Tests could have been conducted on the police car which might have yielded some interesting results. Unfortunately, as has happened all too often, the chief was probably afraid of adverse publicity and his response was to limit access to the witnesses. Here the opportunity was lost to gather additional evidence. This might have yielded something of scientific importance. It might not have been related to alien visitation but some sort of rare natural phenomenon. Whatever the case, the opportunity for a proper investigation was missed. The 1939 photo found in the documents recovered by Shepherd Johnson from the National Park Service. The document outlines everything that those who found the mummy did, their on site observations, and the history of the mummy. This should end the claims that this poor, unfortunate child is an alien, or even a deformed human. It provides precise descriptions that are based, not on guesswork on a slide, but by those who handled the remains in 1897 and documents about its history. This should end the useless debate that has raged since the May 5th fiasco and the claims that somehow the new photos have been altered in some fashion. The trail has been found and followed. It took several weeks, but only because the requests had to work their way through the bureaucracy that is government work (not to mention that those at the National Park Service do have many other duties). This also shows what can happen when we all work together as opposed to working against one another in secrecy. Johnson deserves a round of applause from all of us for his efforts. New Confirmation for Photograph of the Roswell "Alien"
(Blogger's Note: It is with some trepidation that I post the following, given the reaction yesterday to Tony Bragalia's name on the article. But here is additional information, important because of the allegation that the image we all had yesterday was painted on a photograph of a shelf in a museum. Today we have a source for the photograph that couldn't have been altered because of the timing of it. And, importantly, it is from another source. I will note, that given the whole story, I'm not convinced that Benerd or Hilda Ray took the "original" slides photograph because that evidence is somewhat obscure, but this unfortunate child is the source of those slides. Who took the original photograph is unimportant given that we have identified the object photographed. The Rays could be called a red herring and as of today, are not important to this story. We can erase them from all that we know because, at best, they photographed a mummy and at worse, were blamed for the photograph because someone had a bunch of other slides they had taken. 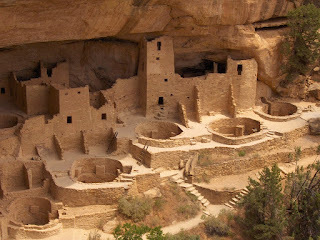 I can now confirm that the photo that appeared on the Net (courtesy Jorge Peredo through his friend Jose Caravaca) that shows the “Roswell Slides” body in a National Parks Service museum in Arizona is that of a child mummy that had previously been displayed at the Mesa Verde Museum in Colorado and photographed by Bernerd and Hilda Ray. Although Jose and Jorge were not able to show with certainty that the photo was taken at the Arizona museum, I have just made a discovery that does. I had in my previous piece found a newspaper article by a travel writer who saw the mummy in Arizona and recounted researcher David Rudiak’s timeline of the display and transfer of the mummy within the National Park Service system. But now something that is photographic proof has presented itself. Working with my German research associate ,and by using a deep review of Google images and online photo albums, and by using key word searches on various search engines, this amazing confirmation was found on the account of an elderly lady named “Frances” who had posted on the Picasa Web online photo album site. She has 43 albums online which include everything from reunions and vacations. One of her trips was to the State of Arizona. And on that trip, she photographed the “Roswell Slides” mummy, on display at a National Park Service museum. This conclusively proves that the image at the Arizona museum is not photo-shopped as some defenders of the “Roswell Slides” such as Jamie Maussan are now stating. It was placed online in 2008 and it was taken in either 1957 or 1967. Thanks for linking back to my article in "Missing the Message or Missing the Forest because of the Trees"
"Jorge Peredo was the one who actually found the picture. He posted it at his web site:" followed by the link. Jorge Peredo posted the image on Facebook after contacting Maussan. I wrote the article at Week In Weird declaring "Case Closed". This could cause confusion for your readers who are confused enough demanding Caravaca/Bragalia get credit. I hope this clarifies the situation about how all this went down in the last twenty-four or thirty-six hours. This is all about getting those who did the work the credit for that work. To be clear, Tony Bragalia wrote the article I posted... He gave credit, first to Jose Caravaca and then to Jorge Peredo... I was going to add more here, but hell, you all can read as well as I can. Yesterday morning (June 10), when I checked my email, I found a half dozen different people telling me that another picture of the mummy in the Roswell Slides had been found. Some of them mentioned Jose Caravaca and some of them didn’t. Some just noted that the mummy in the new picture was the same one in the slides and that was the end of the story. Tony Bragalia provided a short article that provided documentation that linked all the pictures together. I thought the story good, checked it quickly and then posted it, not in an attempt to rehabilitate Bragalia, but because this should end the debate about the image in the Roswell Slides. Bragalia’s article, at the end, credited a number of people for their discoveries, and since I had the link to Caravaca’s web site, I added that at the end so that others could look at his post. To me, the story was the new picture and how it provided the one bit of evidence that some thought necessary to end this controversy. Imagine my surprise when the first reactions were not to discuss that image, but to complain that Bragalia was somehow attempting to take credit for the work of others. That was something that I hadn’t thought about it because the story was the image in the picture and not the author of the posting. Well, the solution for this, I thought, was move the link to Caravaca’s story to the Blogger’s Note at the very beginning to make it clear where the information had originated. Of course, that turned out not to be accurate either because there was a third party involved. And that seems to be where everything originated. Jorge Peredo tracked down the picture and posted it, along with a note from Jaime Maussan, who claimed that someone had painted a picture of the mummy on a shelf as a way to distract us from the real nature of the Roswell Slides. In another post or email, he suggested that it had been photoshopped, apparently ignoring the documentation that provided the clues about this and that linked that image to the one in the Roswell Slides. Others, rather than looking at the information, were outraged that Tony Bragalia had written an article about it. The “byline” was causing the aggravation believing that Bragalia was attempting to grab credit for the find. He had noted, at the end of his article, that it was Caravaca who had found it and later still acknowledging, as we all have, that it was Peredo who found it. The real outrage here is that so many commented on the short article that I posted, not on the content which was important but because they didn’t care for the author. 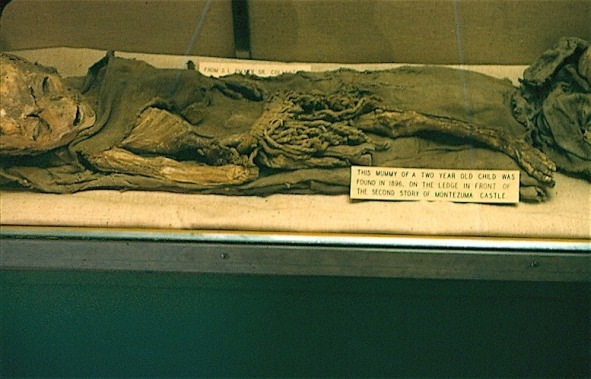 Here was a second photograph of the unfortunate child that proved it to be a mummy on display in a museum. The outrage should be directed at those who continue to claim that this is an alien when the evidence, from multiple sources with the proper documentation had been provided. The important point was not that Bragalia had written the article based on information from several sources, but that the mummy had been identified in another museum setting. The point should have been that the “mystery” had been solved. For those interested, Bragalia’s role in this was to provide a synopsis of the information that could be posted quickly. I didn’t see it as an attempt by him to claim credit for work that he hadn’t done, but an attempt to circulate the best evidence available and he did credit those who had done the work at the end. I posted it because I thought the information should reach as many as possible as quickly as possible. It just never occurred to me that some would take offense at Bragalia’s name on the article he wrote. The other thing is that it seemed that all day we were changing the article to reflect what was going on. I moved Caravaca’s name to the top and referenced his blog so that credit would be given to him… only to learn that he had done what I had done which is to say, post information that came from many sources. Once I learned, at Rich Reynolds’ blog and the Anomalist web site that Peredo had made the discovery, I updated the article. So now, I would hope that we’re all on the same page. The important point is not that Bragalia wrote the article for my blog, the important point is not that others had a hand in the discovery, the important point is that the picture was found and credit given to the man who found it. The important point is that we now have the proof that the “alien” in the Roswell Slides is an unfortunate boy who died many centuries ago. (Blogger's Note: While I fully expect there to be more push back on this, a close examination will show that the mummy in the top picture is the same as that in the second. Clearly it had been moved from one display to the next, but the documentation available shows that it is the same mummy. I know the argument will continue, but I would hope that rational thought and a dispassionate examination will resolve the issue for most. Ahh, will the updates never end... According to several, including Tony, the person who found this is is Jorge Peredo. As Tony wrote, "That is right, Jose posted it, but the individual who actually found the image is a man named Jorge Peredo." And to keep this going, here is the original post about finding the mummy. Photographic proof that the infamous “Roswell Slides” body is not extraterrestrial has finally been found. 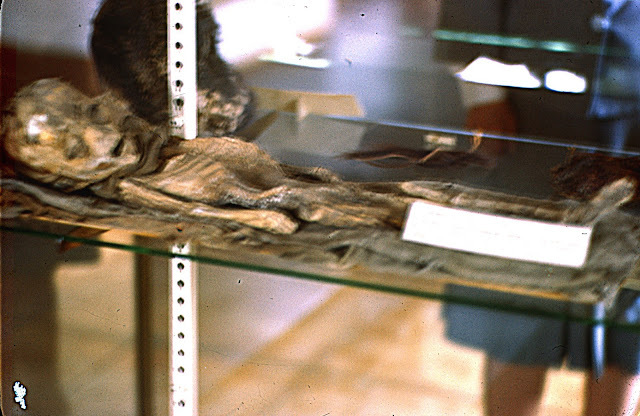 The above photo of a child mummy, once speculated to be related to the UFO crash at Roswell, conclusively matches a photo taken at a National Park Service- operated museum in the American Southwest. In the above photo, the similarity of features between this known photo of a child mummy and the one shown at a May 5th presentation and promoted as unearthly, is undeniable. They are photos of the same child. The photo even has another placard behind the mummy that reads “From S.L. Palmer Collection.” S.L. 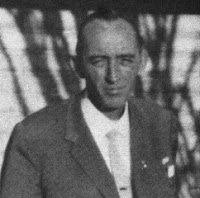 Palmer was the person who donated the child mummy to the Mesa Verde Museum in 1938. Mummy as seen in the Roswell Slides seen here for comparison. Another photograph the comes from a private Palmer collection shows another child mummy. Palmer excavated eight mummies in the Mesa Verde and surrounds. Here is a picture found of one of them. It’s similarity to the “Roswell Slides” mummy features a mouth in an open position that duplicates that of the slides’ mummy. The compressed small nose is also very similar as is the very high forehead. Thanks to Jose Caravaca from Spain for the mummy photo, thanks to “Ralf” from Germany for the Orlando Sentinel lead, and David Rudiak for the NPS archive information on timelines. There was a time when I believed that once a sighting had been solved, once a real solution had been offered, we could eliminate that case from our files. We wouldn’t have to worry about it because we all knew what the answer was. That was back when I was younger and somewhat naïve. made the whole thing up in an attempt to stop Morris K. Jessup from writing any more UFO books. The Allende Letters, and the annotated copy of the Case for the UFO sent to the Office of Naval Intelligence, was a hoax. Allende even signed a statement for Jim Lorenzen saying as much. Or take the case of Thomas Mantell. Here was a man who earned a Distinguished Flying Cross during the Normandy Invasion as a transport pilot. 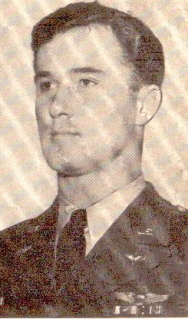 After the war he transitioned into fighters and in January 1948 was leading a flight near Godman Army Air Field when he was asked to attempt to intercept and identify an object over the field. Mantell could not reach the altitude the UFO was operating at and he was killed in his attempt. It is clear from the declassified records that this was an aircraft accident. Mantell lost consciousness around 25,000 feet with his aircraft trimmed to climb. It rolled over into a power dive at 30,000 feet and broke apart long before impact. The object he was chasing based on the descriptions and drawings in the Project Blue Book files suggest it was a huge balloon and not an alien craft. Unless you think that this is a phenomenon of the 1940s and 1950s, there are always the Gulf Breeze sightings. Here was a case in which the model used in the best photographs was found. The evidence offered seemed to refute the idea that there had been some spectacular sightings with photographic evidence. Nearly everyone believes the photographs are a hoax but there are still arguments about it. believe that some of the footage in the autopsy film is real. And now we’re stuck with the Roswell Slides. It is clear from the evidence that the slides show a mummy. It is clear that someone in the inner circle had to know the truth about this, but it went forward anyway with some of the people simply ignoring the obvious. Once the mummy was identified by reading the placard, once the museum was identified by comparing the slides to other photographs in that museum, once the journal article was found corroborating the evidence, you would have thought that the debate would be over… but no, we’re told the placard doesn’t matter and the research continues to prove that the body is that of an alien. David Rudiak is continuing to work to nail down the photographs and other scientific information so that we might put this, briefly, to bed. I have no confidence that any evidence offered will be accepted as authentic if it doesn’t show that the body on the slide is alien. The fallback position seems to be that the scientists from the May 5 presentation pointed out all these “nonhuman” characteristics so the evidence to the contrary is unimportant… just as the admission of hoax by those involved in the Alien Autopsy is unimportant. The point is that no matter what evidence is presented, no matter who admits the hoax, no matter what is said and done, there are those who are going to reject the evidence and believe what they want. I simply do not understand how you can reject the evidence that you don’t like… oh, I get that sometimes the evidence isn’t as persuasive as it is in these cases and that there can be legitimate disagreements, but I don’t understand how you reject the words of those who participated in the hoaxes when they say they made up the stories or when the evidence clearly leads to a specific conclusion. But that is what we contend with day after day here.